2. Column D – How to assess the severity of a mistake. 3. Column E – LSI or Long standing issue. 4. Column F – Who noticed the mistake? We all have a personality and we all have personality defects to varying degrees, some more and some less. In Section 2.1 – Self-awareness is the first step to personality development, we discussed how important it is to have self-awareness of one’s personality defects in order to become a better person. Yet understanding oneself is not easy and it may take many months to unravel the nature of one’s personality and mind, let alone working on removing one’s personality defects. Analysing oneself objectively can be quite difficult and is an ability that can take time to develop and requires one to be objective and honest about oneself. It is also linked to one’s earnestness to understand one’s real state of mind. In the previous chapter, we shared with you how to go about documenting various incidents and situations where you had made a mistake or had an adverse reaction. This is the first step of collecting data about yourself. Once you have documented various mistakes, you are ready for the next steps of how to go about analysing your mistakes. In this chapter and the next couple of chapters, we explain these next steps. We will provide a framework on how to analyse and assess the root cause of a mistake along with gaining an understanding of its severity/gravity. 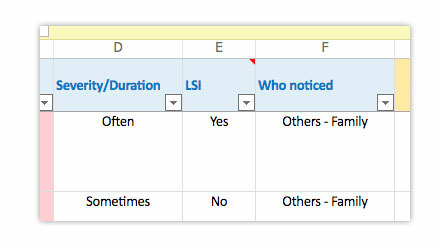 In this article, we discuss how to analyse mistakes as per columns D, E & F in the downloadable Personality Defect Removal Chart in MS Excel. Nature of the personality trait or characteristic: In this case it refers to the nature of the personality defect. Momentum of the personality defect: This refers to how fast the personality defect can make a person act or react. It can also refer to the duration of the reaction. A basic undesirable personality trait refers to a personality defect that has been prevalent for many years for example since one was a teenager. These are generally characteristics that are engrained in a one’s personality. The impact on the people around us and on society. We not only consider that a characteristic / personality trait has a certain quality (a nature) and quantity (frequency of manifestation) but also consider that it has momentum or force. Thus, the momentum of some characteristics may be judged by the time factor. Let us take a look at the above in relation to a few examples and it will make it more clear. Basic or secondary The habit has been present for the past 20 years – therefore it is considered ‘basic’ as it is engrained in his personality. Momentum of the personality trait Continues to be short-tempered for a number of hours when his anger is provoked. Basic or secondary Secondary – The short temperedness escalated 1 year ago after he lost his job and has not been able to get one since. 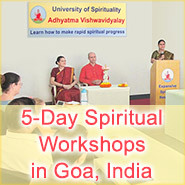 Impact on others High – Upsets the peace at home with family and also with friends. Some characteristics in one’s personality may enhance or nullify others, for example one’s intelligence and/or knowledge that alcohol is bad for health may alter and reduce the ‘liking’ for alcohol. As you can see from the above examples, one can analyse and determine the severity, momentum and impact of one’s actions and reactions. In order to capture this in one’s daily PDR chart, we have provided column D in the daily PDR chart template spreadsheet. Depending on what you categorise your mistake as in column C i.e., incorrect actions, incorrect reactions or where there has been an incorrect action and reaction (i.e., both), accordingly the drop down options in Column D change as shown below. By analysing the severity of mistakes due to personality defects, one is able to make a better decision on which personality defect to work upon as a priority. It is also an indication of how long it can take to overcome the personality defect. In the picture below we share how to decide which personality defect one should work on first. 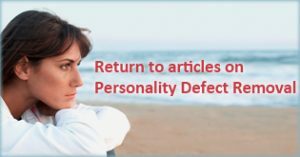 Personality defects which have a high amount of severity and due to which other people get affected should be addressed as soon as possible. In some cases, the impact of one’s personality defect can affect millions thereby exponentially increasing one’s negative destiny (karma). For example, when a corrupt politician steals from a nation due to greed for personal gain, the impact is much larger. 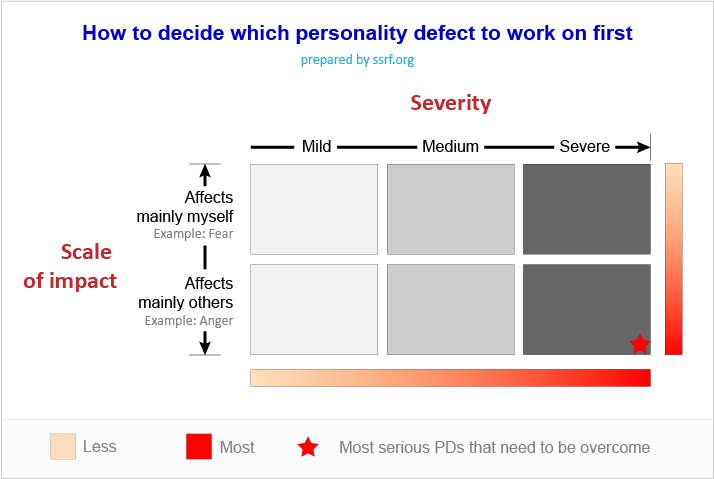 If one is unable to work on the most severe PD for some reason, then one may start with a lesser personality defect and later attempt to overcome the more deep-rooted defects. In column E you have the opportunity to highlight whether an incident/reaction that has occurred is a long standing issue in your case. The options are a simple ‘yes’ or ‘no’. For example, if for the last decade one has observed a reaction in oneself such as ‘a feeling of jealousy when a colleague has been complimented’ then in column E, one can mark that reaction as a ‘Yes’. My marking a ‘Yes’ against that incident mentioned in column B, you highlight for your own self-awareness that such incidents have been possibly giving you or others some degree of pain for many years. This column is related to the previous column D on ‘severity’ and it helps one to understand the intensity of a personality defect that is causing mistakes and for how long it has been bothering one. Alternatively, if it is not a long standing issue, one can mark column E as a ‘No’. In this column you have the opportunity to specify who noticed your mistake. There are basically two options to choose from – others and self. This is important to note as it helps one understand one’s level of self-awareness. If others are noticing more mistakes of yours than you notice, then it could be an area of concern as it indicates that you are less aware of your actions and reactions and their impact on others. 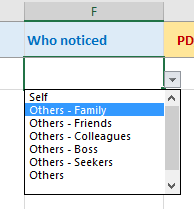 In addition to the above, the drop down also lets you choose the segment of people who have noticed your mistakes such as family, friends, colleagues, seekers and your boss. 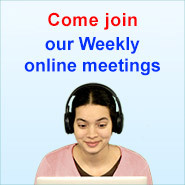 People that interact with you on a daily basis are more likely to observe your mistakes. Be alert if they get angry with you or pass a remark about something you have done or not done. If you look at this form of feedback objectively, then you will see that they are in fact telling you something about yourself. Even if you do not agree with it, it is a considered a mistake in their eyes, so it is best that you note it down and introspect upon it. Once you have settled into the PDR process, you can even proactively go and ask the people you often interact with about anything they have noticed in relation to where you could improve. You could ask them to give specific examples of situations where they feel you have fallen short. As you start attending satsang and undertake some form of satsēva, then seekers who are more familiar with the PDR process have the opportunity to observe you and help you in identifying areas for improvement.